The Annan hotels listed below are either in the town or we have given a rough guide as to how far they are from Annan. We hope you enjoy your stay and find your ideal accommodation from our list of Annan hotels and/or the surrounding area. Location: approx 5 miles from Annan. With a beautiful rural setting in the spectacular Scottish countryside, this small, family-run hotel is halfway between Lockerbie and Gretna Green, just off the A74(M). Only 20 minutes from Gretna Green, the Cressfield Country House Hotel is based in Townfoot, a small village in picturesque Dumfries and Galloway. Just a couple of miles from the M74 motorway, this charming country hotel is conveniently located, with good access to the region's major road network. The hotel is secluded enough to offer peace and tranquillity for a restful, relaxing and restorative stay. The Cressfield Country House Hotel can cater for all your needs, from bed and breakfast to weddings, events and conferences. The hotel offers a high standard of cuisine with food made using locally sourced produce wherever possible. All rooms are en suite and have TVs, hospitality trays and telephones. Location: approx 5 miles from Annan. Situated just 10 miles north of Gretna and well located in a scenic area of south-west Scotland, Kirkconnel Hall is a magnificent 15th century manor set in extensive gardens and grounds. From the roaring log fire set in the original freestone fireplace to the decorative stained glass window overlooking the main hall, the building retains much of its periodic charm. Each of our 11 en-suite bedrooms are decorated to a high standard and provide scenic views across the Scottish countryside. Recently acquired by its present owners, Kirkconnel Hall is now a family owned and run business and we look forward to welcoming you. Location: approx 4 miles from Annan. 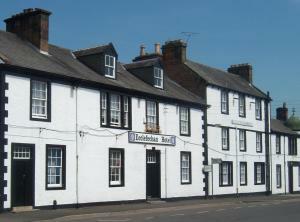 Less than a mile from the M74, the Ecclefechan Hotel nestles in a country village. The Grade C Listed building offers modern facilities, including free Wi-Fi, in a traditional setting. A family-run business, the Ecclefechan Hotel has en suite rooms and free parking. The bar features classic entertainments such as billiards. Ecclefechan is just 10 km from Lockerbie and 25 km from Dumfries. Close to the motorway, there is easy access to activities across Dumfriesshire including golfing, shooting, fishing and cycling. Ecclefechan itself is home to a Roman fort and social historian Thomas Carlyle's birthplace, now a museum. Thomas Carlyle's Birthplace, The Arched House, Ecclefechan, Lockerbie DG11 3DG. Tel: 01576 300666. The great social historian Thomas Carlyle was born here in 1795. The interior reflects life in the late 18th Century and contains collections of portraits, manuscripts and personal belonging of Carlyle. About 5 miles north of Annan. The Ruthwell Cross, Ruthwell, Annan. The cross is located inside the church in Ruthwell. The Cross was carved by skilled Northumbrian sculptors in the early 8th century. It is the most important Anglo-Saxon cross in Scotland and a monument of international importance. The cross originally stood near the present church. In 1664 it was pulled down and smashed on the instructions of the General Assembly of the Church of Scotland. In 1802 it was re-erected in the manse garden and in 1887 was moved to a specially built apse in the church. About 6 miles west of Annan.